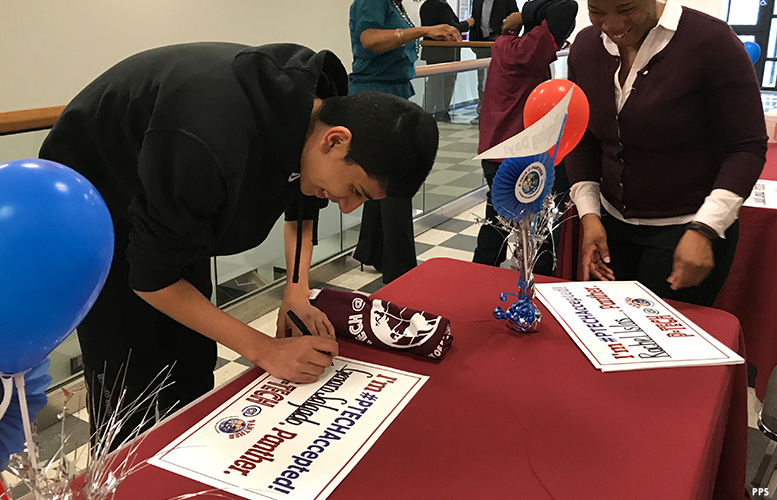 Five dozen eighth graders signed up for the district’s new P-TECH high school at Panther Academy that will prepare them for middle-skill technology jobs. Students in the program will graduate with a high school diploma, an associate degree, and practical experience in the tech sector. The district’s Pathways in Technology and Early College High School (P-TECH) is one of three in New Jersey announced late last year by governor Phil Murphy. It’s a program similar to the apprenticeship model prevalent in Germany. Students in the program will be prepared for jobs in cybersecurity, cloud computing, advanced manufacturing, and healthcare. Many jobs in these fast-growing parts of the economy require more than a high school diploma, but not a four-year degree. The school district will run the new high school in partnership with IBM and the Passaic County Community College. “We are thrilled to be part of the team,” said Martin Laird of IBM. The students had a chance to meet hometown football star Victor Cruz, a big proponent of STEM education, at the signing event. For example, his foundation supports the STEM program at the Boys and Girls Club of Paterson. The P-TECH high school at Panther Academy is slated to open in Sept. 2019. The school is funded by a $300,000 grant from the New Jersey Department of Education. Yeah, okay. You keep dreaming about that. Doesn't Schafer get more than $300,000 a year, even with sagging test scores, poor college going rate, and no education in schools whatsoever?